The Day of Service drew about 100 participants, including Unity College students, to work on a variety of civic improvement projects. UNITY — Logan Wadick, 12, pulled weeds from the gardens, dug in the dirt and gathered dry beans to be baked in the ground for a future community meal. Wadick was at Triplet Park Saturday afternoon, volunteering with fellow members of Boy Scout Troop 233 as part of Unity Barn Raisers’ fifth annual Day of Service. The Mount View Middle School student, whose father, Jon, is the troop’s scoutmaster, has volunteered all five years. During that time, he helped build the pit for the bean hole in the park. He also helped clear community trails, picked up litter and stacked wood. Wadick is considered a valuable contributor to the Unity Barn Raisers, as his generation eventually will take over the nonprofit organization, which was started in 1996 to help enhance the small town character and rural environment of Unity and surrounding towns, while nurturing the local economy. A community that works together is one that can shape its own future and in doing so, advance the quality of life for its inhabitants, members say. The Barn Raisers have renovated historic buildings; drawn businesses to the area; established and maintained the local trail system; built and operated the Unity Community Center, where the organization is based; and created and operated the community gymnasium. The organization also offers space for a local soup kitchen, operates the community meals program and provides a warming space for people in colder months. The annual Day of Service, which ended Saturday with a pig roast dinner at the community center, drew more than 100 volunteers Saturday, including Unity College students. They helped clean up area elementary schools, worked on trails, picked up litter on roads and sidewalks, spiffed up cemeteries, dug potatoes for a community food program, did landscaping work at the community center and helped older people in their homes. The volunteers, of all ages, work in the spirit of the barn raisers of the past, according to the organization’s interim programs director, Mary Leaming. 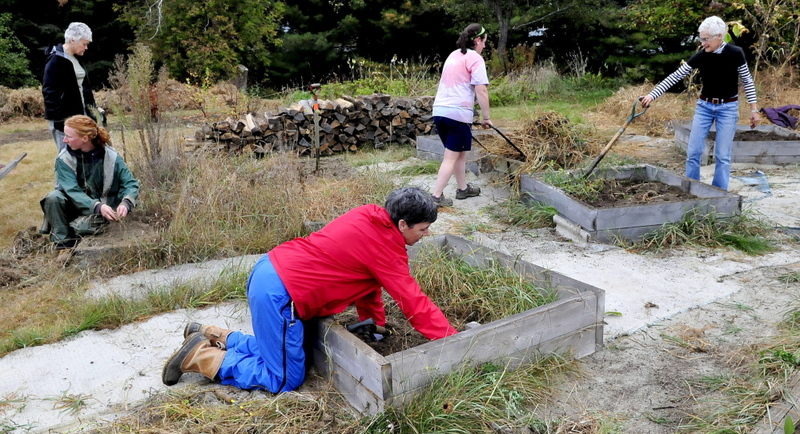 Diane Hull, 65, said she finds enjoyment and companionship in being part of the effort. She came to Unity in 1998 to help launch Centerpoint Publishing, a large-print publishing company, but lived in Waterville. She worked long hours, so she got to know few people in Unity at the time, she said. When she finally moved to Unity and was about to retire, she knew she had to get to know people so she would have people in her life. She started attending community meals, and Tess Woods, then the executive director of Unity Barn Raisers, started asking her to volunteer for various events. “I volunteered for a Day of Service and for different things, and the next thing I knew, I got a call asking if I’d consider being a board member,” Hull recalled Saturday at the community center. She agreed to do so. Although she retired from the board in June, she continues to help. Unity Barn Raisers, she said, is a special organization that fosters not only volunteering, but also friendships. She said she expected about 125 people to attend the pig roast later in the day. The meal is a big fundraiser for Unity Barn Raisers and helps the organization do its charitable work. Like Hull, other retired board members continue to volunteer for the organization — and they help recruit new members. Volunteer Nancy Rosalie, 62, the wife of board member John McIntire, said Unity College and Mount View High School students fulfill their community service requirements by helping at the annual Day of Service. Rosalie helps organize the annual MOFGA Common Ground Country Fair. At Triplet Park, named for triplets who died Jan. 12, 2000, in a fire in their home on that property, the community service work Saturday held special meaning for the volunteers preparing gardens for fall. “We also lost our fire chief that day — Bob Jones, who had a heart attack while filling the tank truck,” said Melissa Bastien, a park steward. Bastien, who owned and operated a nearby bed-and-breakfast at the time of the fire, said it was a horrific day, but creating the park was a way for the community to heal and move in a positive direction. The park, run and maintained by volunteers and funded with donations, offers year-round children’s activities including story walks, which Bastien leads. The park has a boardwalk trail and benches. 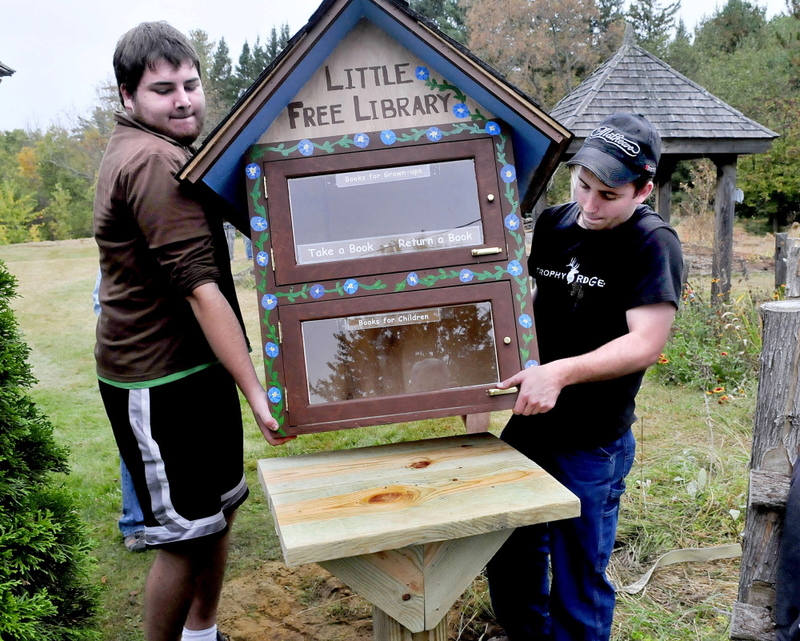 On Saturday, a little library in the shape of a house was erected on the site where people can borrow and donate books. Bastien said Unity, a small town of 2,000 people, is unusual in that it not only has Unity Barn Raisers, but also numerous other large, well-known nonprofit organizations such as the Maine Farmland Trust’s Veggies for All Project, the Maine Organic Farmers and Gardeners Association and Sebasticook Regional Land Trust. The presence of so many caring people in one small place carries a large message, Bastien maintains. “Little town, big community,” she said. The Community Service Day was sponsored by the Unity Foundation, Unitel, Unity College, Centerpoint Publishing, MOFGA, AAA Cellular, DownEast Credit Union, Crosstrax Neighborhood Deli, Varney Insurance Agency, Buckle Farm and others.